Monkey Huggers: Sew Mama Sew Giveaway Day! Welcome to the Monkey Hugs giveaway for the Sew Mama Sew Giveaway Day! This is the first time I am participating in Giveaway Day and I am a little bit late to the party, but better late than never, right? Giveaway Day is a biannual event hosted by Sew Mama Sew - businesses and blogs all come together to give away some wonderful handmade goodies or supplies for no other reason than the fact that it's fun! 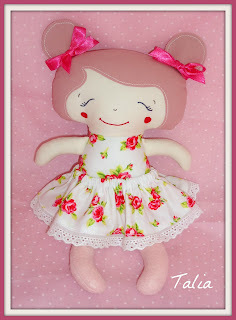 Talia is a little sister doll made from a Dolls And Daydreams pattern. 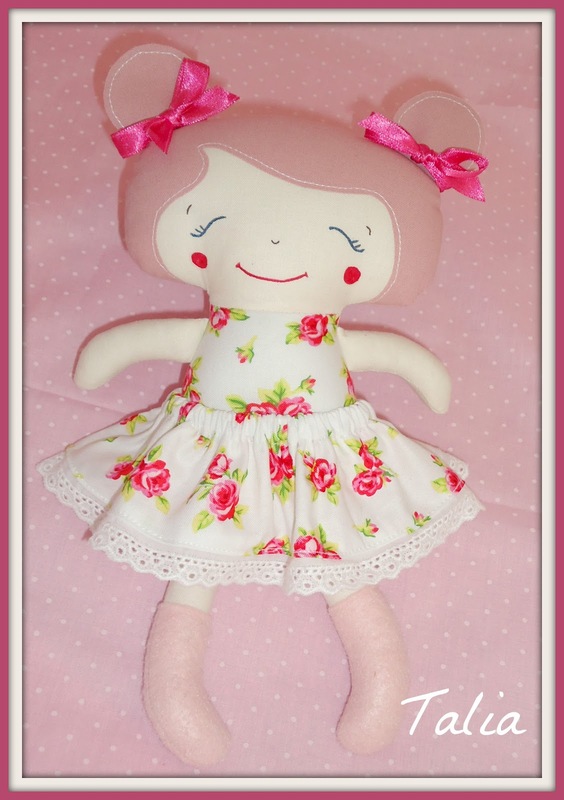 She is a real little sweetie and is made from 100% designer cotton with cute felt socks (which are attached) and a removable skirt. Talia's hair is also 100% cotton. Talia's face is handpainted and heat set and she comes with cute ribbons in her hair. She is approximately 24cm tall and is the perfect size for little hands and she comes with her own birth/adoption certificate! visit my handmade.com.au shop MonkeyHugs and tell me one of the items currently for sale. You must leave a separate comment for each entry that you make UNDER THIS POST (for example, comment with "follower of this blog - Sam Gibson" or "liker on facebook - Sam Gibson", etc). Make sure you leave your name as part of each comment! As Sew Mama Sew is an American Business, the giveaway closes May 25th at 5 p.m. PST, which if my conversion is correct makes it 10am on May 26th here in Australia! (AEST time - I'm located in Queensland). I'll announce the winner chosen by random the next day here on the blog (and will link on facebook). International entries are most welcome! Thanks for visiting, GOOD LUCK and be sure to enter more giveaways at Sew Mama Sew! Hi! New liker on Facebook - Talia is lovely! Thank you Jackie - welcome and good luck! Thank you Peggy - That is a lovely compliment. Welcome to my little blog and good luck! I liked your FB page as Peggy Gibbs. I am a new follower. I love the doll she is just gorgeous. You have done a fantastic job, can't believe you are giving her away. Lucky us!!! I love Mason the Super Hero Boy Doll in your shop. I am looking forward to seeing more creations in there. I love the Mason Superhero doll! So sweet! Thank you Deana - he is a bit special - I don't get the chance to make a lot of boy dolls, so it is refreshing when I can :) Good luck in the giveaway! I am a new follower of your blog. It''s so cute! Thanks Cass - he is one of my favourites - I love making boys :) Good luck in the giveaway! Thanks for following Jamie and good luck in the giveaway! Love that super hero boy in your shop! Love the super hero doll! Cute dolls. Thanks so much :) Good luck in the giveaway! Thanks Penelope - it's nice to see a name I recognise in amongst the comments :) Good luck in the giveaway and thanks for your ongoing support. Hi, new follower of your blog, love your dolls!!! Love your Mason Super hero boy doll in your shop! You're welcome Heather - thanks for stopping by my little blog and good luck in the giveaway! That Super Hero Boy is a cuttie! Thank you Caryn and good luck in the giveaway! Sarah from Dolls and Daydreams does make the most gorgeous patterns :) Thanks for visiting and good luck! Love the Super hero boy doll Mason in your shop! Adaline the handmade doll would be my daughter's favorite shop item. Her red hair resembles a certain favorite Little Mermaid around whom her world revolves. I love all the doll babies. So lovely. Thanks for the chance to win one! Talia is adorable! Thanks for the opportunity to win. I liked you on facebook! Thank you Kate and good luck in the giveaway! I'm a new follower - she is adorable and my girl(s) would love her! Thanks so much for the lovely comments :) I do take custom orders and I love making boy dolls (I hardly ever get the chance as most people order girls!) I have two girls and a boy, so I also get to look at gorgeous girly things and cute boy things :) Good luck in the giveaway! Thanks so much and good luck in the giveaway! Your Kokeshi t-shirt is adorable... and the little girl looks so much like my older daughter! Thanks for the chance! Super Hero boy is so cute! Hello from Minnesota! New follower. I love Talia! And....I liked Super Hero boy. His mask is cool. I really like Adeline from your shop! She is adorable. Thank you Kim - good luck in the giveaway! I am a follower. And boy is she cute!!! I love the dolls. Superhero boy is so adorable! I love the dolls in your shop. The superhero boy is great, and the redheaded Adaline doll is also fabulous. Thank you Tammi :) Welcome and good luck in the giveaway! Thank you Michaela :) Good luck in the giveaway! Your Strawberry Birdhouse top is quite cute! I see a red headed doll named Adaline in your shop! She is a cutie! Thank you Brooke - I am always partial to red hair :) Good luck in the giveaway! hello! i am following you on google reader! Thank you Lindsay. Good luck in the giveaway! Your kokeshi doll t-shirts are so cute--and that superhero doll, I can think of some little boys who would love him! I liked your facebook page--can't wait to see more! 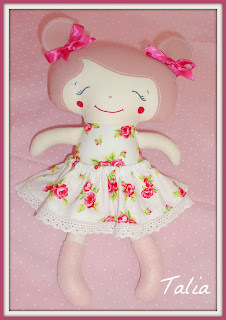 Adaline the handmade doll. I like her firey red hair. Thanks for stopping by and good luck Ann! Thanks Michelle and good luck in the giveaway! Thanks so much Jennifer and good luck in the giveaway! I thought your Shabby love shirt is sweet in your shop! Talia is so sweet according to my 4 year old daughter....thanks for a great giveaway! eeek! so cute, my little girl would love this! i'm a follower of your blog now! I just adore that Super Hero boy you have listed - how cute!! I'm taking part in the giveaway too!! come on over and join the parrrrty! She's so cute! Thanks for the chance to win! -Sarah, new follower of your blog. Thanks Sarah :) Good luck in the giveaway! I am a new follower of your blog, thank you! I'm following your page on Facebook, thanks so much - Talia is adorable! I love Adeline the doll in your shop - she is so sweet! Thanks Keisha and good luck! Not sure how to be a follower of your blog?! I like the Kokeshi t-shirt. Super little doll. Perfect for a little girl I know. Thanks for the chance to win her. I am a new follower. i love the size 1 ruffle nappy cover RNC and pixie top! So cute! What a sweet doll! I love her little hair bows! I'm a new blog follower! I have aperfect home for you beautiful doll! I am a new follower! Please put me in you giveaway. I haved liked you FB because she is lovely!